A Dance Therapist in a Candy Store – Yes, Please! Once a year, dance/movement therapists from around the world congregate at the American Dance Therapy Association’s Annual Conference, hosted each year in a different city in the United States. This year will mark the 47th Annual event, Exploring Vistas and Soaring to New Heights: Dance/Movement Therapy 2012 and Beyond. It promises to bring hundreds of clinicians and dozens of grad students to Albuquerque, New Mexico in October. Perhaps comparing attendance at a professional conference to entering a candy store seems a mismatched metaphor to some, but for this dance/movement therapist it is right on target. The only downside to the conference each year is that I cannot clone myself to attend multiple seminars at once. I really wish I could clone myself. No, really, I do. When I attended the Evolution of Psychotherapy Conference in 2009 (a MASSIVE conference with over 7000 attendees) I listened to current leaders in psychology and medicine – Ernest Rossi, Daniel Siegel, Bessel van der Kolk, Eugene Gendlin, Deepak Chopra, Andrew Weil, among others – all address the mindbody connection in their work. It was gratifying to hear each of them acknowledge the role of the body in healing and it was uplifting to know that so many other scholars with significantly larger audiences are researching and applying concepts that have always been central to dance/movement therapy practice and theory. Oh, the fruit that could be produced from widespread research collaboration between psychologists, neuroscientists and dance/movement therapists! That day is coming, I feel it. But it can’t come soon enough. 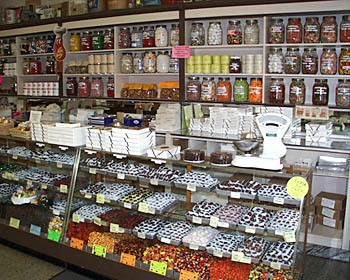 In the service of calling attention to the work of my peers, allow me to provide a glimpse into the candy store awaiting conference attendees in October in New Mexico. The conference is open to all. If you are a mental health clinician of any variety and seeking continuing education or even an aspiring student (in dance, in psychology, in social work, etc) our doors are open. Most workshops will be a combination of lecture, discussion and experiential work. There is even a special pre-conference interactive intensive for non-dance/movement therapists (allied professionals and students) to personally and kinesthetically be introduced to basic concepts of dance/movement therapy so that the conference workshops will be more meaningful. 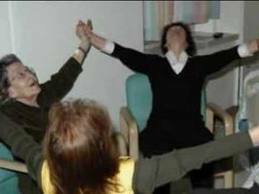 Dance/movement therapy group. Courtesy of ADTA. These are but just a few of the 49 workshops and intensives being offered at the 47th Annual ADTA Conference. You can read about the workshops above and others here. And if you are Facebook-inclined (who isn’t?) you can get updates, photos and more at the ADTA Conference Facebook page. (Oh, and I’ve been invited to present a half day intensive on Zumba Fitness® Through the Lens of Dance/Movement Therapy. More on that later …) You can also read the bios of all the presenters here, which I highly recommend if you want to get a glimpse into who dance/movement therapists are and what we do. Our work is quite diverse and I am fascinated by the unique career paths dance/movement therapists find themselves on. I think you will be too. More and more press is being devoted to people who are benefitting from the inherently healing power of dance. Recently, the Orange County Register reported on a former Laker girl who offers dance classes to cancer survivors. Another online article highlights the work of a social worker using dance and movement in her work with a boy with Asperger’s syndrome. It is always inspiring to read about people’s lives being positively affected by dance, whether it is through Zumba® Fitness or in classes taught by former dancers who know from their own personal experiences how healing and cathartic it can be. Dance IS inherently healing. The pioneers of the profession of dance/movement therapy were also exploring the use of dance as therapy in the 1940s and 1950s, planting the seeds of the modern profession of dance/movement therapy with their respective groundbreaking work with World War II veterans, psychiatric patients and clients seeking deeper self-understanding. With graduate level training, your skills can benefit from the knowledge that dance/movement therapy scholars, researchers and practitioners have cultivated over 60 years. Under the tutelage of renown clinicians, you can learn to hone your compassionate instincts into the refined nonverbal and verbal skills of a trained therapist, one who understands thoroughly the nuances of how to best employ dance and movement to facilitate healing. Dance does heal. Yes! Absolutely! It is therapeutic, cathartic, empowering! Dance has been a healing force in communities since time immemorial. Even though DMT has been an organized profession since 1966, many people exploring the therapeutic use of dance today feel they are creating something “original” and pioneering a new path. 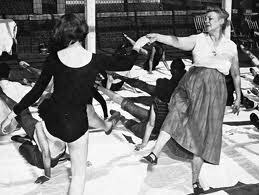 Marian Chace: a pioneer of modern day dance/movement therapy. AND, yet, another truth is that, in fact, we are ALL STILL pioneers. Dance/movement therapists belong to a community of trailblazers that have been on the cutting edge of mind/body medicine since the mid 20th century. However, in a population of over seven billion people, it is hard to hear the voices of less than two thousand dance/movement therapists dispersed around the globe. But, the number of voices is multiplying. Adding to the chorus, amplified by the power of the internet, are an even greater number of voices proclaiming throughout the world that dance and movement is helping them cope – with cancer, with Parkinson’s disease, with depression, with autism, with Life. If you are a person who is helping others express their emotions through dance or cope through dance… we need you and you need us. I remember reading once that, by flying in a V formation, geese can fly 71% farther than if they were flying individually. 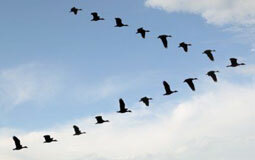 This happens because each flap of the birds’ wings creates an uplift for the birds that follow. Together, let’s grow the research, the scholarship, and practice of dance/movement therapy so that all might understand its efficacy and have access to the healing inherent in dance. I started this blog two years ago out of a deeply felt frustration that I know is shared by many of my fellow dance/movement therapists. I know they share this frustration in some form or another because the topic and the discussion of ways to address it has been repeated – for years – in professional discussions, online forums and local and national dialogues. It is an ongoing issue for our professional community. In the 21st century, how can it be that the profession of dance/movement therapy is not better known? Better understood? At the very least, heard of? Granted, if one is not working in the mental health or rehabilitation or wellness professions, then it is perhaps logical that the profession be an unfamiliar concept. Certainly, I have never heard of countless occupations. But, how can it be in the 21st century, over ten years since the “Decade of the Brain” concluded, that dance/movement therapy is not better understood by our colleagues whose professions involve psychology or neuroscience? How is it that when one googles “dance therapy” on the internet, one gets more references to Brittany Spears and pole dancing or random dance classes than one gets legitimate information on the nearly 50 year old profession of dance/movement therapy? This latest spike in frustration was inspired by the recent feature on Anderson Cooper 360 that took a close look at a day in the life of Gabrielle Gifford’s rehabilitation at the TIRR Memorial Hermann Hospital in Texas. How is it that when Dr. Sanjay Gupta visited the hospital to get a hands on experience of a day in the life of Congresswoman Giffords’ recovery, dance/movement therapy was not included in the diverse list of therapies? Yes, music therapy was on the day’s agenda and, to Dr. Gupta’s credit, he really appreciated the power of music therapy to work “on developing … attention, memory and overall executive function.” This acknowledgement on a show as respected and widely viewed as CNN’s Anderson Cooper 360 is a real boost for our colleagues in the music therapy profession. 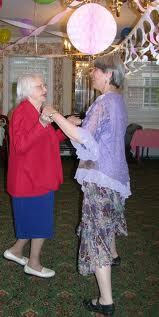 But dance/movement therapy was NOT on the schedule and it was not addressed by Dr. Gupta – by name. However, a quick glimpse at the video of the music therapist, Maegan Morrow, reveals that she was incorporating movement with the music to help her patients improve cognitively and learn to walk again. “Lean 2, 3, 4, Push up, 2, 3, 4…” The diverse therapies at TIRR Memorial Hermann Hospital work together to rehabilitate patients from traumatic injury… and yet the experts on using movement psychotherapeutically, who are specifically trained in connecting through movement and facilitating movement and rhythm – for whatever end goal – are not on that team? Movement is not only integral to healing psychologically, it is integral to effective rehabilitation of the brain, to learning and to brain plasticity. Though my peers and I ask these questions – how, how, how can the world not know? – we do so, of course, acknowledging the onus is on us, the dance/movement therapists. This is precisely why I blog on DMT, why I encourage my colleagues to do the same and why I am writing a book on the topics of this blog. Neuroscientists have declared the importance of psychomotor processing to learning. The New England Journal of Medicine published that dancing, moreso than any other leisure activity, decreases cognitive decline in senior citizens over 75. Physical therapists have published repeatedly on the therapeutic value of dancing the tango for people with Parkinson’s disease. These are but drops in the bucket of research that RIGHT THIS VERY MOMENT reveal the importance of dance and movement in our lives and yet… the official profession of dance/movement therapy remains in the shadows. Compared to the combined fields that make up verbal psychotherapies (social workers, marriage and family therapists, psychologists, counselors, psychiatrists) – and even to our allied creative art therapists – dance/movement therapists are still very small in number. We practice in countries all over the world but only have seven graduate programs in the United States where the dance/movement therapy master’s degree can be earned. There are additional ADTA approved “alternate route” programs for individuals who have a master’s degree in a related mental health field to get the requisite DMT training; even so, a handful of programs can only produce so many dance/movement therapists a year. The simple fact of the matter is that at the Evolution of Psychotherapy Conference in Anaheim, California in 2009, the leading psychologists and psychiatrists in the world presented, among other things, on the importance of acknowledging the body in psychotherapy: attending to bodily sensation, breathwork, moving, mindfulness, meditating. The handful of respected dance/movement therapists that attended with me sat, nodding, in agreement. Yes. Yes, we know. This is what we do. This is what we have done for over forty years. The simple fact of the matter is that 10 million people worldwide are participating in Zumba® classes each week, many referring to it as their “therapy.” Television news stations are doing stories on the effect of Zumba® on its students and teachers alike, noting its therapeutic value in places as unusual as prisons. Again, though Zumba® is a fitness class and not dance/movement therapy, the fact that dancing is experienced as being “therapeutic,” even within the structure of an exercise class, comes as no surprise to those in our profession. The world is discovering in its own ways that movement and dance and the bodymind connection are important. This is wonderful! This growing awareness should be shining an ever-expanding spotlight on the profession that has been implementing these truths in its clinical practice for decades. Dance/movement therapists have not just discovered the power of movement to evoke emotion… or heal trauma… or break through isolation… or express that which cannot be spoken… or garner insight… or connect with self, with others. Dance/movment therapists have an extensive body of research and theory that delves deeply into these subjects. Our expertise can be your expertise… if the dialogue begins. We must be on the edge of a fusion, of an integration, of a collaboration between verbal psychotherapies, neuroscience, medicine and dance/movement therapy that will change the course of healing and wellness and recovery in this new century. We must be on that edge. I can feel it. But the awareness has to spread so that the curiosity can pique and the collaborations can begin large scale. Dance/movement therapy must go viral. That is my challenge to you. Help spread awareness. The research and the experts are there to back it all up. What is needed is awareness. Dance/movement therapists making breakthroughs with children with autism. Dance/movement therapists teaching staff and caregivers essential nonverbal communication skills to more meaningfully connect with those with dementia and Alzheimer’s. Dance/movement therapists empowering women in India who are survivors of human trafficking and sexual abuse. A Dance/movement therapist helping child soldiers in Sierra Leone feel empathy again – and teaching others how to continue the work in their communities through dance. A dance/movement therapist who has designed a movement based curriculum to help foster empathy and prevent violence in schools. There is not enough light cast on this work nor on its potential to effect real change in the lives of millions of people across the globe. If your life or the life of someone you love has been touched by Alzheimer’s, autism, bullying, cancer, trauma, Parkinson’s, mental illness, an eating disorder, body image issues, brain injury… if you have ever felt the power of dance in your own life, on some level, please pass this on. This is a “virus” the world desperately needs.